Japan has been invaded by aliens–but this is no ordinary assault. These extraterrestrials are cute and extremely dangerous. Their mind-blowing powers are way too much for the military. Enter Mao-chan, the daughter of a great general, and her charming best friends–Japan’s only hope against this massive attack of the adorables! 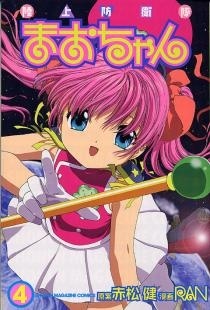 Rikujou Bouei-tai Mao-chan was published in English as Mao-chan by Del Rey in a 2-in-1 omnibus edition from October 28, 2008 to March 24, 2009.